Amber (my YL) and I (K9MU) will depart Eau Claire, WI at 6:00am on December 29th. We will stop in Wausau, WI at 7:30am to pick-up Dave (KC9FQD) and his YL, Michelle. We will arrive at our rental cabin at around 2:00pm EST and be QRV by 3:30pm. 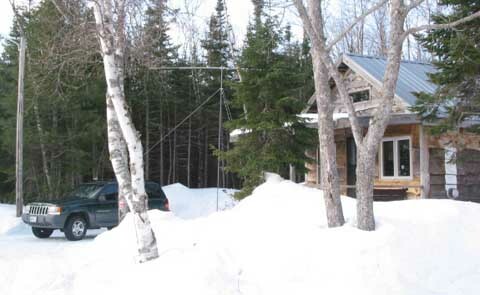 Our cabin is located on the shore of Lake Superior with an unobstructed view to the east, north, and west. Making our locale perfect for both auroral backscatter and auroral Es propagation. We will utilize a 5-element yagi (18 ft boom) on 6 meters and a 2M12 on 2 meters. Both anntenae will be at 20 feet on seperate masts. 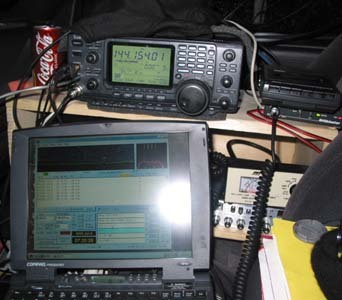 We will have two IC-746's so we can monitor 6m and 2m simultaneously. Amplifiers will provide 300 watts of power on both 6m and 2m. We will monitor our HF liaison frequencies at the top of the hours for five minutes. Please look for us then! 73’s de Justin K9MU/8 and the EN67 crew! The primary goal of our trip is to give EN67 to as many 6m and 2m grid chasers as we can. We will this do by monitoring 50.125 and 144.200 continuously throughout our stay. We will utilize CW, SSB, and FSK441 modes on both bands. We hope that with our operator dedication, moderate power, favorable location, and high antennae gain that we will be able to provide a 'new one' for those who put effort into working us. Our secondary goal is part of collaborative effort between a similarly equipped station in BP75 and our crew in EN67. 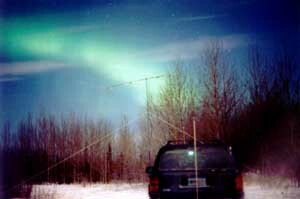 Jeffrey (KG0VL) and his wife Kim will be conducting radio auroral studies from Circle, Alaska (BP75) during the months of December and January. We have coordinated our efforts to better document auroral-E propagated signals within the auroral curtain. We will provide data and a 'signal source' on both 2m and 6m for Jeffrey. We hope to contribute valuable data that may someday be used to answer the mysteries of auroral-E propagation.